Revival Journal: We came to minister but then...WHAT? On August 3rd 1997 I wrote in my journal about a mission trip that a good friend and I went on in July. Here is the story. What do you think about what happened? Let me hear from you in the comment section. A church that my dad and I had once ministered to in Florida, invited me to come meet them in Altoona, Pennsylvania to hold evangelistic meetings. I asked my good friend friend Ryan if he would like to go with me and he agreed. Before leaving Ryan and I went to Steve Hill’s office to ask him for advice and have him pray with us before we left. He told us many helpful things about the ministry and evangelism and then he prayed for us and asked God to use and anoint us. Right before we left his office he said, “This trip will turn out the opposite of how you expect it to.” I really did not understand what he meant, but I never forgot it. I was soon to discover what he was talking about! Ryan and I left the state of Alabama, July the 11th 1997, on a Friday and drove about 23 hours to Altoona, PA. We arrived at 3am in the morning. We drove several miles into the country, found our campsite and were directed to the place where we would be sleeping for the week. It was a little wood cabin nestled in some pine trees right on the edge of a hill. It had slow running water and very cold showers, but it was fun. The next morning we awoke and met up with the leader of our group and the rest of the team that had come from the other church. They were also staying in cabins nearby. 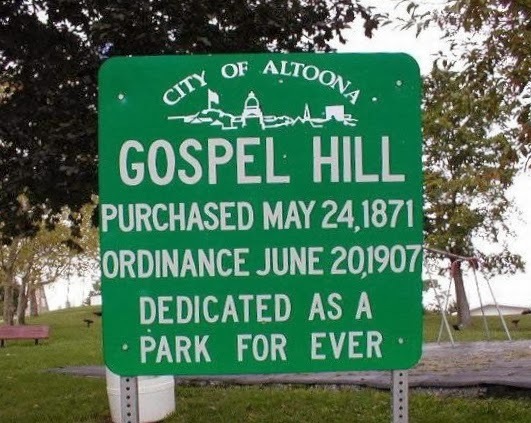 They told us that Sunday night would be our first meeting in the city of Altoona about 45 minutes away. When Sunday night came we drove to the little church, met with the pastor and it was decided that Ryan and I would speak. We shared very simply how God had touched us and changed us at the Brownsville Revival and how he wanted to touch them right where they were. An altar call was given and people responded to God. After this we laid hands on people and saw the power of God move. After the service as we were walking out of the church we noticed about fifteen young people standing nearby so we went over to talk to them. They listened intently as we told them all the things God had done in our lives. It is so good to be able to share something so powerful and real with people. They heard the gospel! On one of the following days I slipped and tore a hole in my heel so had to go to a local doctor’s office. This also turned into an unexpected opportunity to share the Lord. As the doctors and nurses worked on my foot Ryan and I shared with them about the revival and what Jesus had done in our lives and how He had changed us. Soon, every doctor and nurse in the building was in our room listening to us and asking questions. Even though I was in pain I was having a lot of fun. In a way I was glad that I hurt my foot because it led to all those people hearing about Jesus. When we walked out into the waiting room to pay the bill we noticed that the room was full of patients waiting for treatment. The doctors had spent so much time with us they had forgotten about those waiting in the lobby. I walked to the counter to pay my bill and the nurse said, “No charge, thank you for coming here!” I felt like we made friends that day. I thought, “How much better can this get? This is so cool!” I knew God had set it up and that He was going to move powerfully that week. As we worked setting up the band and sound equipment, people began to arrive. I saw many familiar faces that Ryan and I had met on the street finding a place to sit on the grass. I was very excited! "Today I will be reading two different verses in the bible that have to do with God’s judgment, but first I want to quote a verse about His love and what he did for you. This verse is one I am sure you all know. John 3:16 “God loves you so much that He sent his one and only son to die for you.” He was beaten, he bled and his back was torn to shreds. The bible says he was marred beyond human likeness and then he carried a cross on his back that had been shredded by the whip. The Romans pressed a crown of thorns on his head and then they drove nails into his hands and feet. He did it all to pay the price for your sin. At any time he could have called down a legion of angels to rescue him from his certain death. Many who were there had never heard a message about God like that before while others had never heard about God at all. I asked for those who did not know Jesus and wanted to meet Him in a personal, powerful way to come forward. Six people came forward weeping, actually some wailing because God had revealed himself to be real to them in a matter of moments. I could see a joy and an overwhelming peace come over their faces. Many, who had seemed so hard before the service, now were smiling because they had found Jesus. What a wonderful savior! After this we prayed for all of them that God would keep them strong. God touched them powerfully! I remember one particular girl at the meeting that was dressed like a punk rocker. Ryan and I had met her previously in the street and invited her to the meeting. She was in her early twenties and had a baby and wasn’t married. Her ears were full of earrings and her hair was cut short and bleached with crazy looking colors. Now she was standing in the presence of God broken and unable to stop weeping. God had shown His love and acceptance to her! Jesus walked with us that day on Gospel Hill and I was thankful that He did. I thought, “God, what will you do tomorrow?” We invited everyone to come back to the meeting the next day and told them to bring all their friends and they promised us that they would. A sad ending to God’s beginning. After "prayer" the group met together and the decision was final for us not to go back. It wasn’t just that day but for the rest of the week. In one foul swoop of mission trip was done and over. At that point, I realized how important discernment is. To be open to hear God’s voice and heart was more important than supposing a “dream” was from Him. I felt like the enemy had won and there was nothing I could do about it. The enemy saw that God was starting something powerful so he tried to stop it by using fear and it worked! Ryan and I made a decision to drive back home the next day. I was so grieved at what had happened. The day before we left we talked with the camp leader. He was hurt with our choice not to go back as well. He had been so excited by what he had seen in the past couple of days and was expecting God to do so much more. We packed up everything and left early Thursday morning and drove down into the city. We decided to drive by Gospel Hill. There was no one around so we got out of the car and walked up to a park picnic table. I didn’t know what to tell her but to say, “Sorry!” I told her that we would be going back home that day. I asked her to convey to all her friends our apologies for not being there when we said we would be. We talked with her a little more about the Lord and encouraged her to follow Him whole-heartedly. Then we said good-bye. I felt like the Lord showed me many important things that week. Most importantly was the following: First, man can so quickly get in the way and stop something that God is doing. Second, I realized that there are many ministries in the world but not all ministries are balanced solidly on the word of God. When a ministry’s focus isn’t on Jesus and Him alone, it is very easy for the enemy to steer it off the track God has put it upon. When a ministry has to depend on a dream, a “prophecy,” a “psychic reading from the cosmos” or a word of knowledge from an "intercessor" to know God’s will instead of seeking His heart to get direction, it can be considered divination. Jesus said; “Go!” Paul ministered even when he knew his life was in danger as did every follower of the Lord in the scriptures. We need to be cautious that we are not trusting solely in other people’s words to guide us but that we personally seek to hear God’s voice daily and make sure that our decisions line up with the Bible. This is not to say that we do not listen to wisdom from tried and true men of God. There must be a balance in this area!